'Secret love nest for native falcon' The Marlborough Express. August 16, 2012. ‘Project Falcon’ cover and 3-page article in ‘Your Weekend’ magazine, The Press, October 9, 2010. Featured in the University of Canterbury 2010-2011 Research Report. 'Falcon fascinates wine festival fans' The Marlborough Express. February 2010. ‘Wairau Falcon’ Wild Tomato magazine. June 2009. 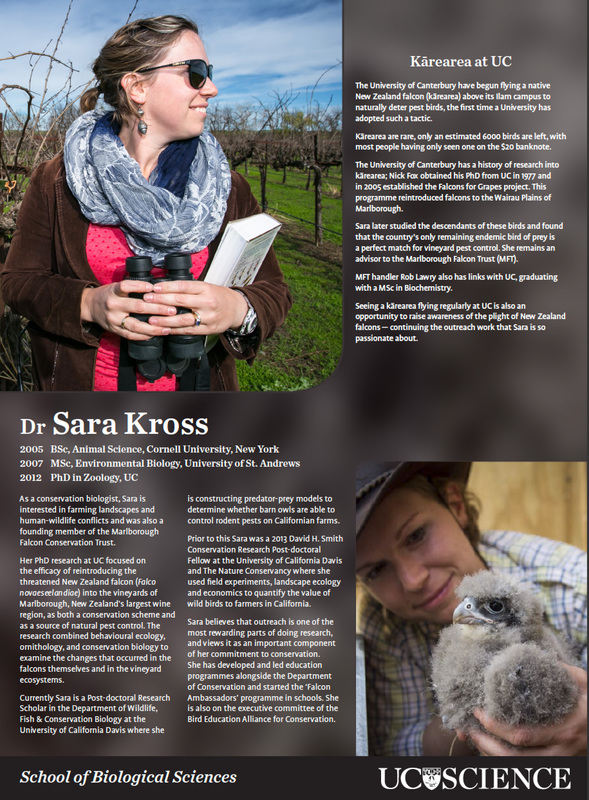 ‘US Researcher on falcon watch in NZ’ The Marlborough Express. December 2008. ‘UC researcher’s NZ falcon project boosted by award of equipment’ University of Canterbury Chronicle. December 2008. Page 4 (saves as a pdf). TVNZ's Country Calendar. Featured in episode 10- Fearless Falcon. Originally screened on April 25, 2009. Radio New Zealand National. Southern Stories- Marlborough Falcons. Originally played on August 9, 2012. Radio Interview- Breakfast with Spanky. 'Big bird saves big bucks.' Discovery News. November 2011. 'Vineyards help conservation efforts: I'll drink to that.' Science 2.0. October 2011. 'NZ Conservation success saves the grapes’ 100% Pure New Zealand (NZ’s official tourism website). August 2009. Awarded a 2015 ‘Inspirational Alumni’ award by the School of Biological Sciences at the University of Canterbury (poster to left). Top publication by a PhD student for the School of Biological Sciences 2012. Student presentation finalist at the 25th International Congress for Conservation Biology. Auckland, NZ. December 2011. Granted the 2011 Raptor Association of New Zealand ‘Kestrel’ award for excellence in contribution and involvement in raptor research. Runner-up in University of Canterbury’s ‘PhD in 3’ 2010 speaking competition, runner-up in ‘Science’ heat and winner of ‘Biology’ heat. Runner-up in powerHouse’s ‘closest to commercialisation’ award at the 2010 Annual Biology Conference at the University of Canterbury. Selected to present research to John Key, Prime Minister of New Zealand, at the opening of the University of Canterbury’s new research building. Student Award to present at the 2010 Romeo Bragato Viticulture & Oenology Conference. ‘Best Poster Presentation by a Student’ at the 2009 Australasian Society for Animal Behaviour conference.